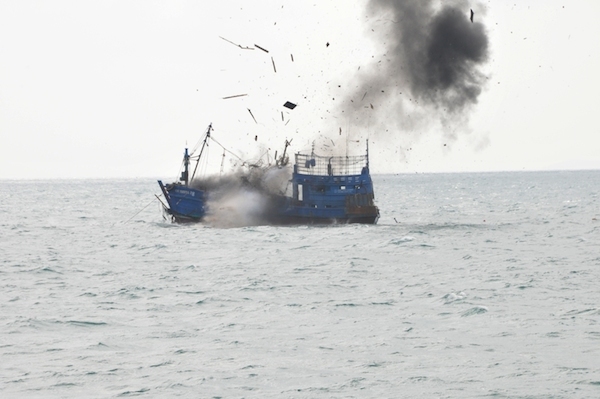 A fishing boat, which was flying Indonesian colors, is sunk off the coast of Riau, Sumatra on February 9, 2015, after the fishery ministry evacuated the all-Thai crew. Photo courtesy of the Indonesian Ministry of Fisheries. Boat bombing has been one of the most visible (and internationally controversial) elements of the new Indonesian fishery minister’s policies. Southeast Asian regional newspapers have labeled the five-month-old policy – to seize and sink foreign vessels caught illegally fishing in national waters –“wrong” and “disturbing.” Indonesian president Joko Widodo preferred the term “shock therapy.” But most recently, Fishery Minister Susi Pudjiastuti explained that the bombings were really based on the concept of sustainability. “Fish, unlike coal, is a recoverable resource. If you maintain stocks early on, it will sustain in the long term,” Pudjiastuti said at a dinner with chief editors of various national publications in Jakarta on Friday. “If our waters are fished out, it will be too late. 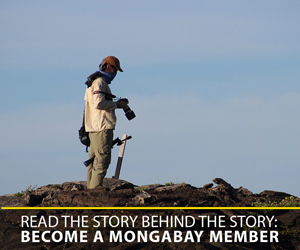 Right now, it’s not too late yet,” she added. Ministry surveys support Pudjiastuti’s claims, showing that many of Indonesia’s fisheries have been overharvested. Not a month after she took office, her ministry set fire to three Vietnamese trawlers, after evacuating the crew. Two weeks later, they sank two boats from Papua New Guinea. By the end of the year, she had added two Thai boats to the tally. At the end of her first 100 days in office (late January), Pudjiasuti had sunk six boats and was processing 14 more for the scuttle list (in every instance, the crew was removed first). Her policy is backed by regulation 45/2009, which bans foreign boats from catching fish in Indonesian waters. Fisherman’s haul near Nyaru Menteng in Central Kalimantan. Photo by Rhett A. Butler. Boat bombing is not the only policy that Pudjiastuti thinks will stem illegal fishing in Indonesian waters, as well as lure investors and protect Indonesia’s oceans. In November during her first month in office, the minister inked two regulations. Regulation 56/2014 places a six-month moratorium on the issuance of fishing licenses for foreign vessels. 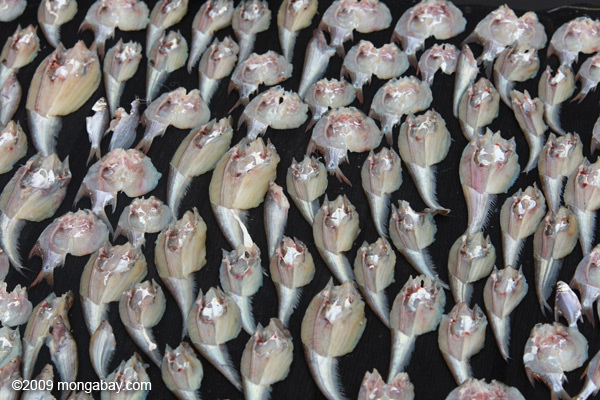 Regulation 57/2014 disallows transshipment, the sale of fish to a foreign party at sea. On April 30, the moratorium on permits for foreign vessels will end, but Pudjiastuti said that likely many of the foreign vessels won’t get the new permits they want, thanks to a rule that the ministry issued in February which bans the use of trawlers and seiners, thereby protecting coastal areas where many species of indigenous fish spawn. “Most of these (foreign) boats are trawlers so they will have to change their fishing methods if they want to fish here,” she said. Meanwhile, Pudjiastuti hopes that the anti-transshipment regulation and the measures to preserve fish habitat, particularly spawning grounds, will encourage investors to move operations to Indonesia.